St. Martin's Griffin, 9781250117045, 512pp. Ranging ambitiously across four continents and four hundred years, Worlds Elsewhere is an eye-opening account of how Shakespeare went global. Seizing inspiration from the playwright’s own fascination with travel, foreignness, and distant worlds—worlds Shakespeare never himself explored—Andrew Dickson takes us on an extraordinary journey: from Hamlet performed by English actors tramping through the Baltic states in the early sixteen hundreds to the skyscrapers of twenty-first-century Beijing and Shanghai, where “Shashibiya” survived Mao’s Cultural Revolution to become a revered Chinese author. No other writer’s work has been performed, translated, adapted, and altered in such a remarkable variety of cultures and languages. Both a cultural history and a literary travelogue, Worlds Elsewhere is an attempt to understand how Shakespeare has become the international phenomenon he is—and why. "The 400th anniversary of the death of the man from Stratford-upon-Avon is a fitting moment for the publication of this beautifully written book, which is at once travelogue, history, literary analysis and love song...wonderfully atmospheric"
"Learning and assimilated high culture...mark out Andrew Dickson’s wonderfully imaginative Worlds Elsewhere....a true travel book, of the best kind." "This book is much more than just a hugely entertaining travelogue. In its strikingly original, engagingly idiosyncratic way, Dickson’s action-packed global quest amounts to a substantial new contribution to Shakespeare scholarship." "An extraordinarily exhilarating book, like no other Shakespeare criticism you have ever read...[Dickson] is a serious scholar, and his cross-cultural insights into Shakespeare are remarkable." "Journalist and scholar Andrew Dickson uses historical records to examine how Shakespeare's work became a global phenomenon, finding resonance in a wide array of countries and cultures and inspiring fascination in figures as disparate as Joseph Goebbels and Nelson Mandela." 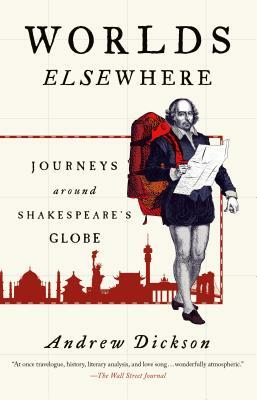 "[a] globe-trotting cultural history...In a series of spirited accounts, Dickson traces the transmutations of Shakespeare’s plays across national and cultural borders....Dickson shows us the many ways in which Shakespeare repeatedly thwarts geographical, linguistic, and political barriers—how little, in historical terms, he belongs to any single culture or nation....Worlds Elsewhere is cheerily lighthearted in tone, and part of its pleasure lies in its commitment to stories of wide-eyed eccentrics and enthusiasts." "Engaging and informative....an absorbing investigation into the varying encounters of the Bard worldwide....Highly recommended for all Shakespeare lovers and also for readers interested in the role of arts and culture in this age of globalization." "The book truly fascinates....a damn good read....An entertaining, informative and hugely enjoyable read, Worlds Elsewhere provides a fascinating look at a man who never set foot outside of England, yet, rather undeniably, changed the whole world. One can only wonder what Shakespeare would think of his reach today." "It's always refreshing when someone blows the dust off Shakespeare studies, and English journalist Andrew Dickson does it with gusto in [Worlds Elsewhere]....his research is impressive; tracing the centuries' long history of each nation's engagement with Shakespeare gives rich context to his vivid appreciations of present-day productions....I was moved and excited by Dickson's celebration of 'defiantly plural' Shakespeares....Anyone who wants to keep the Bard's plays alive in the 21st century should be glad to find him thriving in so many incarnations, 'different at every turn.'" "A rousing and insightful tour through the global manifestations of Shakespeare's works with plenty of information that will even stun even those who thought they knew it all…an eloquent testimony of how cultural motifs gets transmitted, changed to alien climes and still flourish." "Dickson proves himself a genial guide to Shakespeare's huge influence and legacy. A frequently illuminating investigation of Shakespeare around the world."